The Kia K9, shown, is expected to come to the United States as the Quoris. Kia has been busy this year, launching the Cadenza upscale sedan and a redesigned Forte compact sedan and putting the finishing touches on a five-door hatchback, coupe and redesigned Soul that will arrive before year end. And Kia won't rest much after that. The hard-charging brand will continue its upscale push with the arrival of the Quoris rear-wheel-drive flagship sedan, expected to arrive as early as next summer. Kia also has an electrified version of the Soul in the works. The first Kia EV is scheduled to go on sale in either late 2014 or early 2015. The five-door 2014 Kia Forte arrives in the third quarter. Here are highlights of Kia's product plan through the 2016 model year. Cadenza: The upscale full-sized sedan went on sale in April. 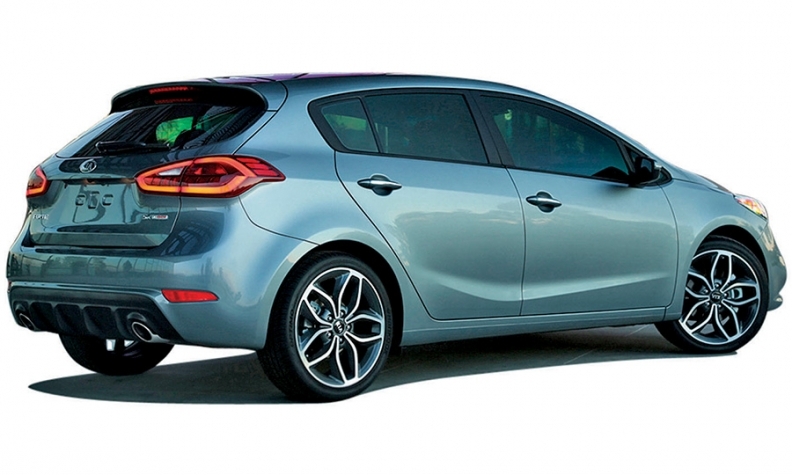 Forte: Kia's compact-car lineup was redesigned for the 2014 model year to ride on a modified version of Hyundai-Kia's global compact-car architecture, which also underpins the Hyundai Elantra in the United States. The 2014 Forte sedan went on sale in the spring, and the two-door Forte Koup and five-door hatchback variants are scheduled to arrive in the third quarter. High-line SX trim versions of the Forte five-door and Koup will be powered by a 1.6-liter turbocharged engine producing 201 hp. GT Concept: Sources say a production version of the GT concept car that Kia showed at the 2011 Frankfurt auto show is still on the table, but it's far from getting the green light from Kia's bosses. A strong business case for the car, an rwd sports sedan, has yet to materialize. Optima: Kia's mid-sized sedan was freshened for the 2014 model year with an updated front and rear fascia, grille, headlights and taillights. The re-engineered Optima is scheduled for a spring or summer 2015 launch as a 2016 model. The Optima's 2.4-liter four-cylinder base engine and a 2.0-liter turbo also will be a carryover, but the next-generation Optima will have all-new sheet metal and a new interior. Quoris: It's all but certain that Kia's rwd flagship sedan will eventually be sold in the United States. The big question is when. The Quoris, known in South Korea as the K9 and expected to be priced at more than $50,000, could arrive as early as next summer, but there's no firm launch date. 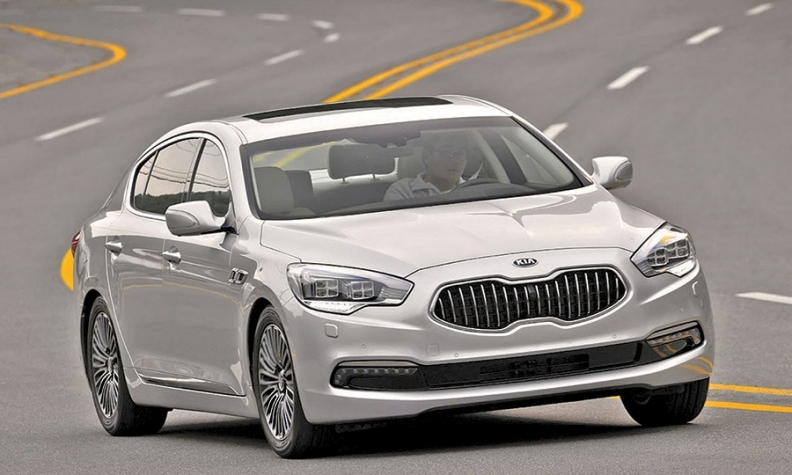 Kia officials are watching U.S. demand for the Cadenza to gauge receptiveness for an even bigger and more-upscale Kia. Rio: The Rio subcompact was redesigned for the 2012 model year. A minor freshening will update the Rio's grille sometime in the summer of 2015. Sedona: Kia quietly returned the Sedona minivan to its lineup this year after halting sales for the 2013 model year. A redesigned minivan is scheduled to arrive stateside in the fall of 2014 with new sheet metal, a new interior and the brand's trademark "tiger nose" grille. Under the hood will likely be the same 3.3-liter V-6 that powers the Kia Cadenza. Soul: The second generation of Kia's boxy subcompact arrives this fall. The 2014 Soul is longer and wider than the current version, and Kia says the new body has nearly 30 percent more torsional rigidity. New sheet metal gives the 2014 Soul a fresh look but retains the upright and stocky proportions. The tacky hard plastics that bathed the first-generation Soul's interior have been replaced with sturdy, soft-touch materials on the dash, door panels and center console. Under the hood is the same 1.6-liter four-cylinder base engine used on the current Soul. An optional 2.0-liter gasoline engine has been updated with direct-injection technology. Soul EV: Kia will launch an electric Soul in late 2014 or early 2015. Details about range, battery size and charging time are sketchy, but sources say its range and cost should be comparable to those of the Nissan Leaf. Sportage: A freshened Sportage arrives this fall with minor tweaks to the headlights and taillights and an updated grille. The next major update, either a re-engineering or a redesign, won't come until 2017. Sorento: Kia moved its top-selling crossover onto a new platform, added a new 3.3-liter V-6 and revamped the interior for the 2014 model year but left the sheet metal unchanged. A new design arrives in the summer of 2015 for the Sorento's 2016 model year re-engineering.